1) Check Swiss Chalet Gift Card Balance Online, Click Here. 2) Check Swiss Chalet Gift Card Balance At Any Swiss Chalet Location. 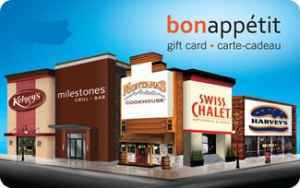 Swiss Chalet gift cards are part of the BonAppetit gift card network that includes several other Canadian restaurants such as Harvey’, Montanas, Kelseys and MileStones. You can use the same online or in store options listed above to check the gift card balance on cards from any of these restaurants. For example you would be able to check the balance on your Swiss Chalet gift card at any Harveys location or vise versa. Often our gift cards end up sitting around the house for years, so long that we often can not even remember what balance is left on the card. There are now alternative ways to use your gift card, in addition to using your gift card for a meal or two you can now sell Swiss Chalet gift cards and use the money to buy whatever you want. That’s right, you can now turn your unwanted gift cards into cash. You can sell your gift cards on Giftah.com, they will give you cash for any of your unwanted gift cards. If you still decide you want to use your gift cards you can also check Giftah.com for discount gift cards to major Canadian restaurants and retailers. Either way Giftah.com will help you put more money back in your pocket. If you are a Toronto Hydro customer there is a new promotion available that offers $75 dollar gift cards to over 250 leading retailers of your choice. All you have to do is sign up for peaksaver a new service from Toronto Hydro that cuts down your air conditioners energy consumption during peak hours. If you sign up for the service Toronto Hydro will install a device to your air conditioner that will reduce its energy consumption. The service helps the power companies save money and consumers should not notice any major difference in the temperature of their homes. After the peaksaver device has been installed you will be contacted to make your choice of the available gift cards. Gift cards are available for Harvey’s, Swiss Chalet, Winners, HMV, Cineplex, Kelsey’s, Canadian Tire, the Home Depot and hundreds more. If the electrical bill is still too large after installing the peaksaver system considering selling your cards on Giftah, a online marketplace for buying and selling gift cards.